Sitting Toilets -- Brilliant Innovation or Health Hazard? 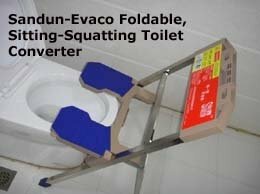 I set up this website to share with you what I know about sitting toilets, the specific ailments and diseases that they can cause, and what you can do about it. This is reflected in the design of the colon and human body. In the sitting position, it is physically impossible to evacuate waste completely and efficiently. This is the reason why those who use sitting toilets often have a vague sensation that there is always 'still something left'. By forcing unsuspecting users to depart from the correct toileting posture, the sitting toilet has caused much distress, pain and suffering. It is not going to end soon. Today, the porcelain throne continues its relentless march, making huge inroads even in countries whose peoples have traditionally been squatting populations. The impact of this trend has been tragic. Worldwide, there is a never- ending, growing epidemic of colon and pelvic-related ailments and diseases. 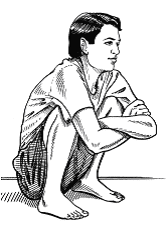 There is no guarantee that those who squat will not suffer from these health problems. But one thing is for sure: the habitual use of sitting toilets is a dangerous habit, one that you would do well to abandon. On this note, I invite you to explore and check out the information on this site. It is my hope that more will discover the truth about the sitting toilet and see it for what it really is: a health threat that has been ignored for more than 150 years!